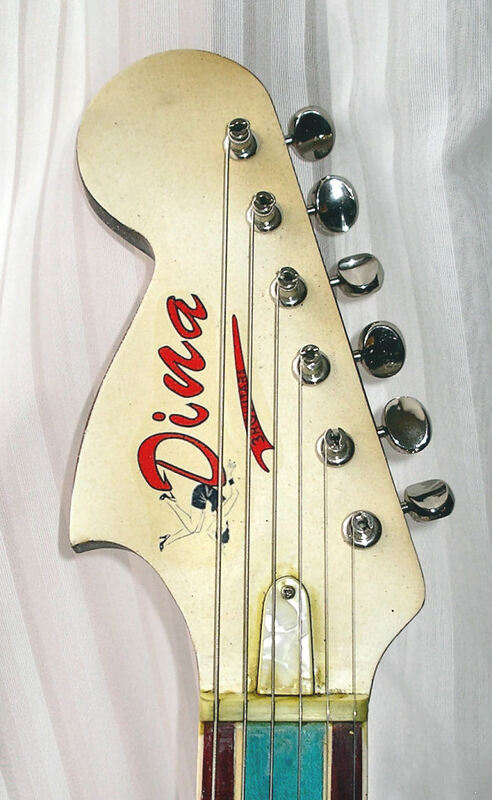 Another of the Dina range of guitars, there's a bit of a personal story behind this one. Many years ago a friend of mine wanted to buy a vintage Les Paul, in the days when they weren't so expensive, he was after a '70s mini humbucker one, I thought I'd tag along as one of the shops we were going to visit had a number of '60s 335s, one of them was a lovely looking faded cherry red and I thought "what the hell if I like it I'm gonna buy it" ... Long story short.... Tried it and hated it, in fact after a lifetime of loving the look of 335s I was put right off them. BUT a strange turn of events followed, the shop owner threw an SG at me, a '62 Les Paul Special, I'd always disliked SG's, I thought that they looked thin, cheap and flimsy... That was until I played this one and absolutely fell in love with it, loved everything about it, right down to the screaming P90s and ever since I've been a huge fan. Why I didn't buy it there and then I'll never know but to my regret it stayed in the shop. 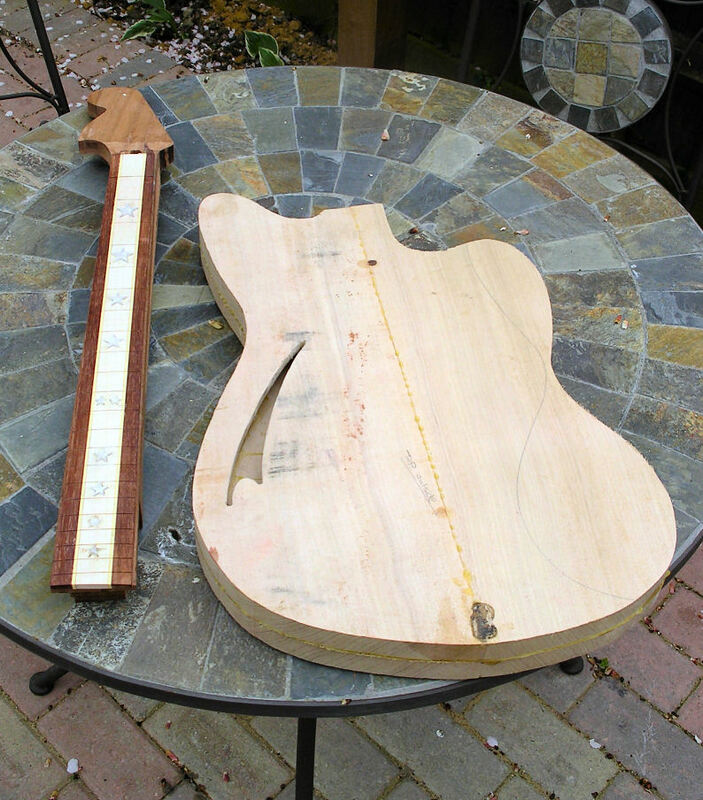 There's not much point in repeating the build pictures as it's the same as the other Dina guitars, body wood is poplar, thinline with typical "f" hole. 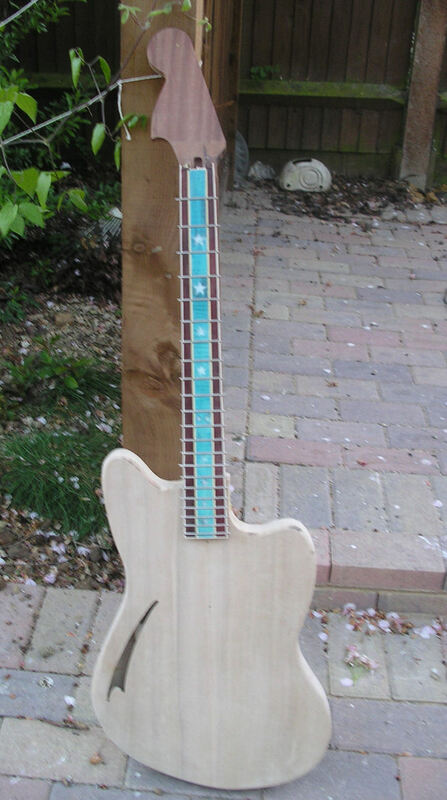 The neck I guess is the interesting bit, it's quarter sawn mahogany with a 3 piece fretboard, rosewood, maple, rosewood with pearl stars. Roughly assembled... 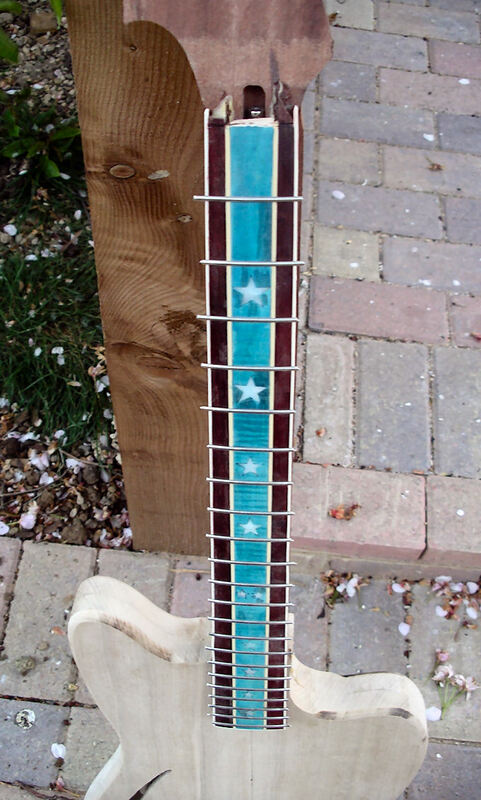 The fretboard effect can be seen a little better here, the idea of the maple was so I could stain it blue and the rosewood red, there are actually four binding strips one on each edge and one either side of the maple, this was for two reasons, one to get the red, white and blue and to stop the red and blue dye running into each other, although quite difficult to "glue-up" it worked out very well. 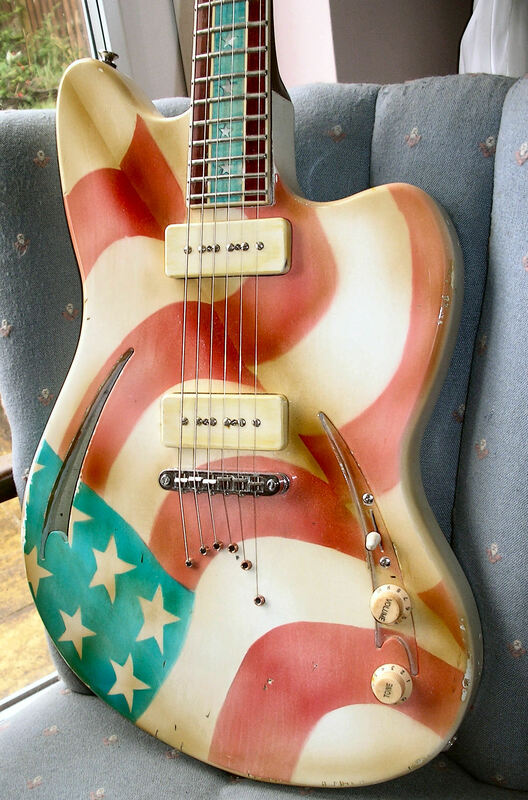 As I wanted to go more for a Gibson style guitar I wanted a glue-in neck so to match I gave it an angled headstock and after doing the Firebird guitar with a reversed headstock which I really liked I decided to go the same way with this guitar. 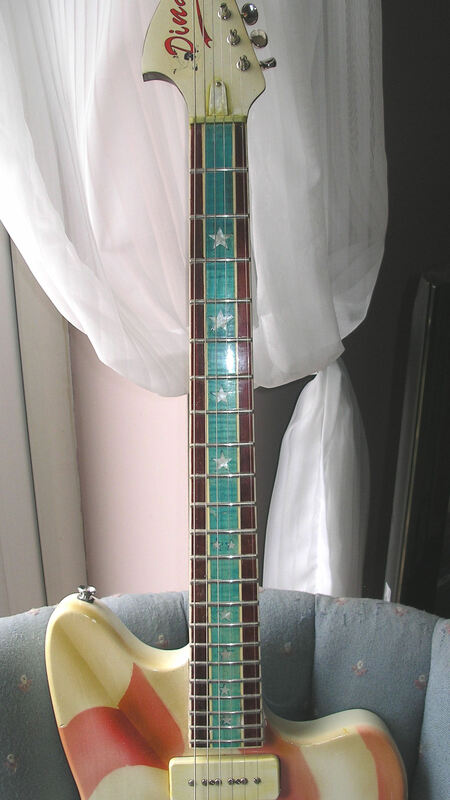 The fretboard during fretting, cutting the star recesses was quite a job but very effective! The fretboard has a 12 inch radius as I wanted it to play more like a Gibson, I also used a much wider fretwire to help the "Gibson" feel. When I first started building guitars I was far more of a Fender fan and the guitars I built reflected this, but nowadays I really like incorporating different features, it does make every guitar I build a little different and more of a challenge, at the moment I'm really favouring set necks, forgive my anti-Fender view point but four wood screws and a square metal plate is kinda crude for a quality guitar, no doubt it works really well and has certainly stood the test of time... I'm gonna shut up at this point before I dig a deeper hole for myself! Jumping forward a bit...The fretboard got lacquered, I made quite a detailed stencil for the flag after much planning, I wasn't going to attempt to do all 50 stars I guessed that it would look awfully fussy so I decided on a section of the flag, the base coat is an off white with transparent blue and red lacquers for the rest and brown tinted lacquer to shade it a little. As usual all the finishing is done in nitro cellulose. Once it has set for a few months I'm going to give it quite a heavy relic treatment, this guitar is going to look like its lived A LOT! I have a feeling that it's going to be one of my favourites. I do like lightweight simple guitars and can't wait to give these P90s a trial run, can't wait to turn the amp up to 13 and rip into the Thunderstruck riff! A few months have passed between this picture and the last, I just haven't had the time to finish it off but at last here it is. I kinda changed my mind and went for a bit more of a low-key look with the relicing and just went for a more "dirty" look rather than bashed about, I though it suited the flag better. As I said at the beginning I pretty much knew what I wanted before I started this guitar, basically an SG with a bit more of a solid feel and it certainly hits the spot. The body although light weight is a bit more bulky than an SG and having a longer scale length there's a bit more tension in the strings, feel wise it plays like a Gibson as it has a 12inch radius fretboard and a very slim neck. I absolutely love P90 pickups, these I had custom wound and they are gorgeous, so easy to get a good sound from. For me this guitar ticks all the right boxes, no nonsense rock and roll and it absolutely screams, I love it!